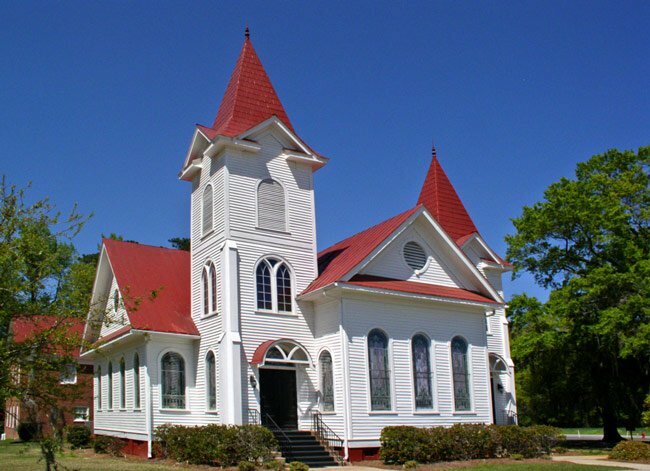 Pisgah United Methodist Church was founded in 1806 before Florence was even a county. First led by Reverend Thomas Humphries, a frame structure was built shortly after land was donated to the congregation in 1813. The current building was constructed 101 years later, in 1914. Contributor James Jenkins was kind enough to send us the below photo along with the following information about the church: “I first saw this church in a photographic book by Dr. N B. Baroody (now deceased, so the book may be out of print) called The Unexpected Visitor by Joggling Board Press in Summerville, SC. I said to myself, if I am ever back in this area (we lived in Florence, SC in the early 1950s) I am going to photograph that church. When I approached the church, there was a field of tall corn in front, so I was not able to duplicate the type of shot that Dr. Baroody made. Below is an article that was contributed to the South Carolina Picture Project by Bill Segars of Hartsville. It originally appeared in his local paper, The Darlington New & Press. It was published in June of 2015. When I was asked to put together some articles about churches in Darlington County, I was glad to share what I have learned, knowing that at some point I’d like to venture out of Darlington County to talk about many other impressive churches that all South Carolinians should see and learn more about. Today starts that expansion; it’s time to venture out a bit and learn more about the beautiful church buildings that you may have seen or certainly should see. Don’t worry, though, we still have more in Darlington County to discover, so keep reading. We will come back home. 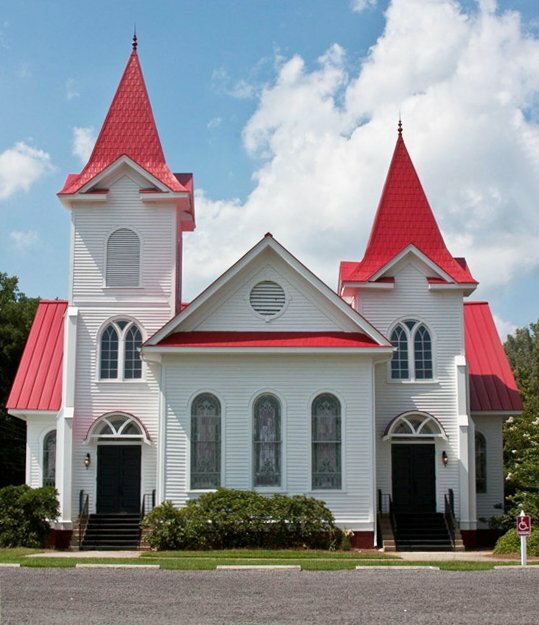 “That pretty white church with the red roof” is our subject for this week, and its name is Pisgah United Methodist Church. Pisgah’s striking appearance and its highly visible location does indeed make it hard to forget, even though its name may not be known by all who drive by it. 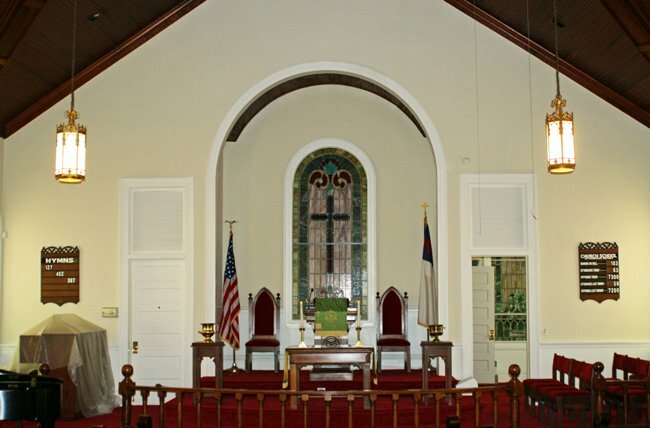 Along with its “postcard setting”, Pisgah also has many interesting historical facts, and the past and present congregations are to be commended for their efforts to retain those records and to maintain their building for all to enjoy. 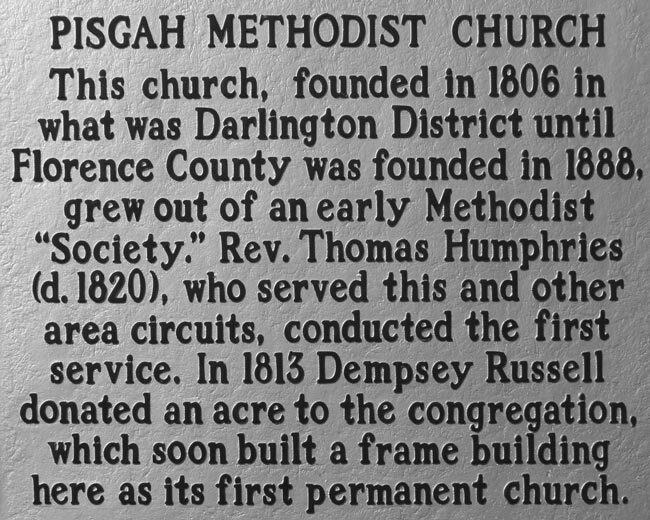 The founding fathers of Pisgah United Methodist had their roots deeply ingrained in this area, which was a part of the Darlington District even before the Revolutionary War. Their attempt to organize into any type of church or religious affiliation seemed to be somewhat scattered, and the church held several different names until February 6, 1806. 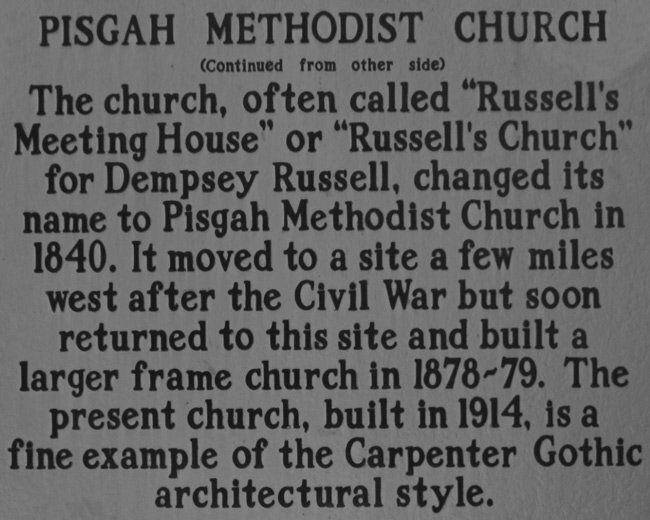 The name of Pisgah is not associated at all with this date, but there is record of the Darlington District Court reading a “citation” on the estate of a deceased person at “Russell’s Church.” A citation was always read at the church or religious gathering place nearest to where the deceased person once lived. So where did the name Pisgah come from? Stay with me, we’ll get there. In December of 1813 Dempsey Russell gave land for a building to be built and used as a church. A one-room meeting house was soon built, and the congregation began to gain new members and grow with enthusiasm. 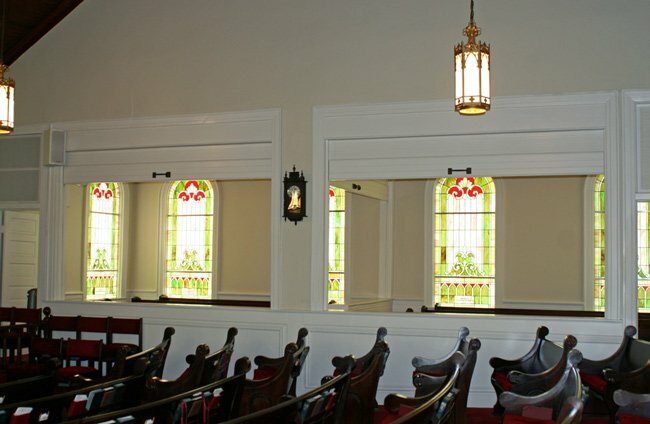 Between 1814 and 1840 this congregation is mentioned in records as “Russell’s Meeting House” or the “Society at Russell’s.” As the political climate in America began to change, so did the climate and personalities in most churches. By 1840 there was not a single Russell on the church roll here. The name of “Pisgah” was adopted, possibly because the 31 members felt like it sounded more Biblical. From here forward the name of Pisgah, in one form or another, has appeared in the official records of this church. Now that we all know the name of “that pretty white church with the red roof,” let’s learn about the building. Even though the membership of Pisgah experienced a slight decline in enrollment after the War between the States when a new church was formed at Wilson’s Crossroads, soon to be Florence, the original Russell land was maintained, and a new one-room church building was built in 1878 or 1879 for $850. In November of 1913, 100 years after the first land was donated by the Russell family, the Hoffmeyer family donated four more acres of land for the purpose of building the present building. This wonderful Carpenter Gothic church building was made basically ready for its first service on Easter Sunday, April 12, 1914 – but not without problems. The first problem occurred very early into the building process, even as the lot was being cleared for the new building. A tree that needed to be removed was accidentally dropped on the 1879 church building, partially demolishing it, so the congregation had no place to worship during the construction of the new building. In spite of a few minor setbacks as a result of World War I, which was ongoing at that time, progress began to appear until work stopped in October of 1913. The original builder quit, just walked off the job, never to return. So the next challenge was to find another builder. Lucius Patrick Raines, a local builder who had recently finished Mt. Elon Baptist Church in Lydia, was talked into completing Pisgah for the fee of $1,075. In December of 1913, work resumed. A big plus for Mr. Raines, who had to finish a building someone else started, was that the building committee did have a good set of building plans. A local mail carrier, L. McDuffie Hicks, had a sincere interest in architecture and had recently completed a correspondence course to become a trained architect. As one of his first projects, he drew a detailed set of plans for the present Pisgah Church. Even with the first service being held on Easter Sunday of 1914, the building was not completely finished until June 28, 1914, when the congregation celebrated with a Centennial Celebration Service in their new building, which at that time had a value of $10,000. As with many churches, this figure may not have been a completely accurate figure, because many members gave time, talents, and materials towards the completion of their beloved church building. Looking for the Odum family and Brigman family. This is the Church I grew up attending and am still a member today. I have so many fond memories of Pisgah growing up! And this is also where my husband and I got married 6 years ago!! !